« Purina Pro Plan Wants to Know “How Is Your Dog Great?” ~ Win a Year’s Supply of Dog Food and Be Seen in a National TV Ad! I want to give a big and hearty CONGRATULATIONS to Susan, the winner of the $75 Gift Card to Joe Button! Susan now has 48 hours to confirm! I also want to give a big and hearty CONGRATULATIONS to Missy, the winner of the Set of 5 Chuggington Wooden Railway Engines from TOMY! Missy now has 48 hours to confirm! I also want to give a big and hearty CONGRATULATIONS to Brutus, the winner of the RKS Workout Series with Kettlebell of Choice! Brutus now has 48 hours to confirm! I also want to give a big and hearty CONGRATULATIONS to Trixx, the winner of the Almondina Assorted Cookie Gift Box! Trixx now has 48 hours to confirm! 2 Responses to *** WINNERS *** Susan, Missy, Brutus and Trixx are Living the Life of Riley! CONGRATULATIONS! Shellie and I thank you! 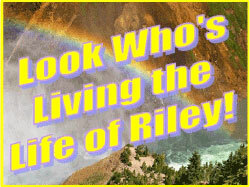 *** WINNERS *** Jennifer, Dave, Eileen, Katie and Io are Living the Life of Riley! CONGRATULATIONS!